Comfort Mobility Medical was founded to create as an answer to the rising home medical and mobility needs in Florida. Our exclusive Showroom has 25 to 30 therapeutic lift chairs on display. Comfort Mobility Medical’s selection guarantees the greatest responsiveness and flexibility in the market. 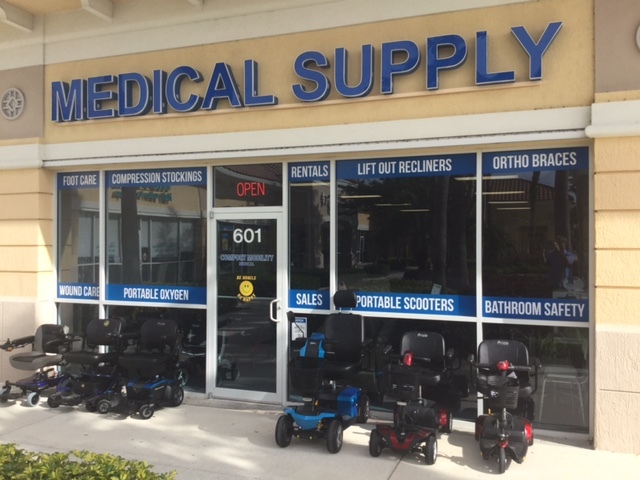 At Comfort Mobility Medical, our business philosophy and passion is to provide a full line of home medical supplies and equipment. Our focus is to consistently exceed expectations in the realms of quality, service, value, and professionalism. Comfort Mobility Medical is committed to exceptional, high quality service in the field of home medical products. Comfort Mobility Medical has become a leader in the medical supply and equipment industry. In our product showroom, you will find a wide array of durable medical equipment, aids, and supplies. From respiratory equipment, mobility products, oxygen concentrators, and aids to daily living, to compression therapy, wound care, and orthopedic supports and braces- we have everything you need all in one place! Contact Comfort Mobility Medical via phone call, form on our contact page, or visit our store at the Pubix Shopping Center with questions. Our team of dedicated and knowledgeable specialists are ready to assist you in any way!